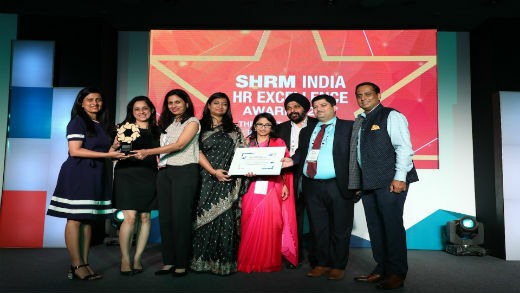 New Delhi: Continuing to excel as a Great Place to Work, InterGlobe Enterprise has been conferred with Excellence in Learning and Development Award at the SHRM India HR Awards 2017. The award recognises corporates who have exemplary practices around delivering impactful employee learning opportunities and set benchmarks for leadership development. This award is an affirmation of InterGlobe Enterprise’s consistent efforts towards enhancing innovation-led breakthroughs in the learning and development arena. Some of the key initiatives that contributed towards this success were the senior leadership development and coaching practices by InterGlobe Enterprises and the best in class skill development and customer centric training by ifly, the learning academy of IndiGo (InterGlobe Aviation). As a leading conglomerate, InterGlobe is also at the forefront of building a value-driven performance culture that helps in development of employees and adapts to unique learning models of the millennials. To win the coveted award, the applicants go through multiple screenings. The finalists that emerge through the Level 1 & 2 evaluation, make a presentation to the Final Jury Panel and the winners are announced at the SHRM India Annual Conference, Awards Night. This year the ceremony witnessed a distinguished gathering of business leaders, academics, environmentalists, economists and legislators from across the country at the Taj Palace, New Delhi.